Crackdown is one of my favorite games of the past generation, and even Crackdown 2 despite its numerous issues had left me satisfied. But Crackdown 3 for some reason doesn't make me want to play it all, despite all of Terry Crews efforts in this trailer. Let's up the latest delay (February 2019) will help make this game a bit more appealing. I'm not as excited for Crackdown 3 as when Microsoft first announced it, the delays and bad news surrounding it really chipped away at my excitement for the game. 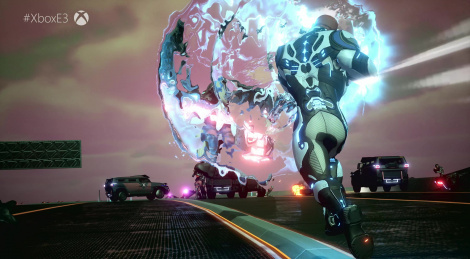 But if it's at least as good and addictive as Crackdown 1, I will play Crackdown 3 for many, many hours. PS. I also really liked Crackdown 2, thought I was the only person in the multiverse to have enjoyed it. Happy to see another Crackdown 2 fan. the mistake MS made with this game was treating it like their pillar releases (halo, gears, forza) it never was, and new will be that. it doesn't matter how much they polish it, or how much they add to it, or how much they spend on it, or how much they delay it. it's crackdown. a game that's only still around because the first game had halo 3 beta access included. i'll still buy it because i loved crackdown 1, but it should have released in 2016.
also. anyone else hate the new agency vehicles? they looked so cool in crackdown 1, and now they look like tron rejects. The game has clearly been rebooted twice now along with the changes in main developers and even the fact the original version had nothing to do with Terry Crews in it. Compared to last year this looked more polished, with improved graphics, more varied, and with Crews even more front and center. Well at this point with all the delays I thought Crackdown 3 was vaporware. I was never a big fan of this series but to be honest, the game looks much more polished and mildly interesting. It will be interesting to see if MS can pull out a par when this was headed to a double bogey.